Location: Stage left, appox ten rows back standing. Sound on the night was incredible, one of the best gigs sound wise I’ve been to but it was incredibly loud and I accidentally left the Edirols Auto Gain Control setting on (normally manually set the input) which leaves much of the recording fairly brickwalled. It’s not too bad but the thudding from the walling covers a lot of detail. Missed the end of Through Silver in Blood due to dead batteries. Missed maybe 5 minutes worth. 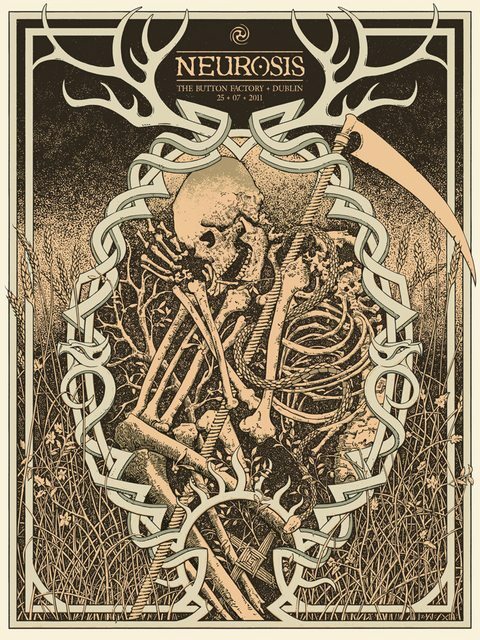 This is the first show Neurosis played in Ireland in maybe 10 years I think and after missing them on many, many occasions as various festivals around Europe I had to go see them. Support on the night came from local metal/noise group Drainland who ould be probably best known for the CD they put out on Southern Lord Records last year. Since then they’ve been one of the most prolific bands in Ireland releaseing split record after split record. They’re launching their fifth split record in about a year next week and I hope to get recordings of that gig too.